There are moments and then there are moments that don’t pass by us as much as they pass through us. People talk openly and eloquently about where they were when President Kennedy died, or when the Challenger space shuttle exploded, or on 9/11. But transformative moments can also be private. Our individual, caregiving moments are often silenced because they represent the point in time when everything we once knew is turned upside down. The permanence of a loved one’s diagnosis. The suddenness of a loved one’s heart attack. The realization that a loved can no longer remember our name. The deep grief of mourning for someone we know whose life will never be the same. The moment we realize that life as we once lived it will never be the same is a universal experience but one endured in silence and isolation because . . .
For us, the world stops spinning. Our caregiving moment of realization freezes us in our tracks as others around us seem to move even faster and louder and more frenzied than ever before. We want others to notice what we are witnessing. We want them to notice something different about us so they will ask. So they will at least know. But they don’t. Others keep going and moving and responding as if life was the same though our world no longer makes sense. Even though we may look and sound the same to others, we are not. The safety net of habit and routine is replaced by a heightened sense of the fragile, unpredictability of life. We can’t help ourselves from becoming anxious about things we didn’t even think about before. We now see fragility—everywhere—whereas others still walk blissfully through life, hand in hand with the habits of everyday routine. We are no longer guided by routine—everything seems new and strange. It’s as if we find ourselves walking on a tightrope without a net. And the scariest part is that we realize we’ve been living all this time without a net, but we had never noticed until now. But now that we notice, we can’t unlearn what we know and return to life as we once lived it. We are caught in-between multiple worlds, finding it difficult to find our place anywhere in particular. On the one hand, we are expected to be conversant in the joys of those who believe life is permanent—“What’s on television tonight” and “Let’s make plans for next year.” On the other hand, we must also be able to understand and attune ourselves to loved ones whose conditions remind us that life is always fleeting—“Say goodbye now because we don’t know if this will be our last goodbye.” Most of us aren’t allowed the privilege of choosing one world over the other. Instead, we must incorporate ourselves into both worlds, finding ourselves constantly restless and uneasy knowing that we don’t feel like we completely belong to either world. We can easily get stuck in a perpetual present that makes us fearful of the future and unsure of what we remember about our past. Caregiving prevents us from confidently predicting life beyond today because care is not a future tense—it’s an unfolding act that requires our body and mind to be focused on what most others take for granted. We can’t be what we once were even though we so dearly want to return to life as it was once lived. As our days unfold, the life we lived before our caregiving moment disappears before our eyes. We know we had a past, but it recedes into a deep fog that now seems inaccessible as if our lives before were lived by someone else. That person, that innocent person we used to be, seems like a stranger to us now. What is your caregiving moment? Where were you when care became a central part of who you are? Every caregiving experience is different, but behind every caregiver story is a moment—a moment when we realized that the care and love we were called to provide would make us different in every way possible. 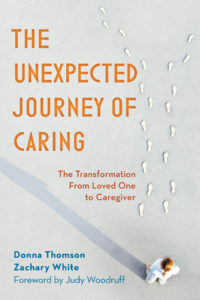 Our caregiving moments need to be shared because they will remind us that the need for care isn’t unusual or unexpected. It’s just part our ongoing, collective story. Sometimes it not the caregiving moment but the actual loss that is most impactful. Those moments are definitely harder for those who have never experienced such things to “get” or understand. Well said, Teresa! Well said. I’m so happy that I read this today. Thank you! This is a caregiving moment from my book, The Four Walls of My Freedom – it’s about learning to be alone in my garden. I remember reading a film review in the newspaper. I never actually saw the film and I cannot even recall its name. But the reviewer’s words are still with me today. The film was about a convent somewhere in Europe. A young nun complained about having to wash dishes and scrub pots. The Mother Superior chastised her, saying, “There is meaning in those dishes, in the act of scrubbing.” As the reviewer said, the film was a testament to the idea that the extraordinary exists within the ordinary; that the entire moral universe can be found in the mundane tasks of everyday life. This sense of wholeness and connectedness is what I found in my garden. I almost forget “who” I was before I started caregiving. I feel like I’m in a continuous haze, never getting the time to figure out who I have “become”… feels like “I” am drowning or have already drowned sometimes, and it’s awful. Josephine, Thanks for sharing your experiences. We are glad you have found the Unprepared Caregiver community whereby we can speak authentically about our care experiences. Donna, Thanks so much for sharing your caregiving moment. I love the quote you provide from your book, “The Four Walls of My Freedom” because it speaks to the challenges (and necessity) of creating meaning out of everyday experiences. Your book is on my “to order” list as if it is anything like your blog posts, it will be full of insights!